Recessions are part of the economic cycle. It's important to know what a recession is, and what causes it. First, this doesn't include two consecutive quarters of declining-but-positive growth, where you might see a positive growth rate that is slower than in the previous quarter. If GDP, for example, comes in at 2.1% in a quarter, whereas it came in at 2.2% in the previous quarter, that would be a mere slow down of growth. In a recession, we would see back-to-back quarters where the growth rate is actually negative - the economy actually contracts. It shrinks. Maybe we'd see growth rates that look like -2.1%. Second, people always talk about GDP, but let's clarify this. Gross domestic product shows the value of all goods and services. So if, on net, values of products and services that people and businesses purchase increase for a period of time, we have an expanding economy. The rate of that expansion may slow when we are at the peak of the economic cycle, like the above 2.1% growth rate example. Recessions can happen after the peak of the economic cycle, when GDP reaches a high point in the cycle, although the real trigger of a recession is discussed below. At the high point, inflation (the increase of prices of goods and services) rises, causing demand to fall. Consumers reign in their spending and businesses are forced to lay off employees and cut wages. Demand for goods and services then falls, causing prices to fall, a phenomenon called deflation. Businesses also cut their spending. Not only do they cut operating expenses like wages or marketing, but they also reduce their capital expenditures, or large investments in long-term assets like property plants or equipment used for production. This slows down production, and therefore sales, which in turn is not great news for employees and workers. Weak consumer spending ensues. On the flip side, you've got a boom. An economic boom - the opposite of a recession - is when economic growth expands at an increasing pace for a sustained period of time. 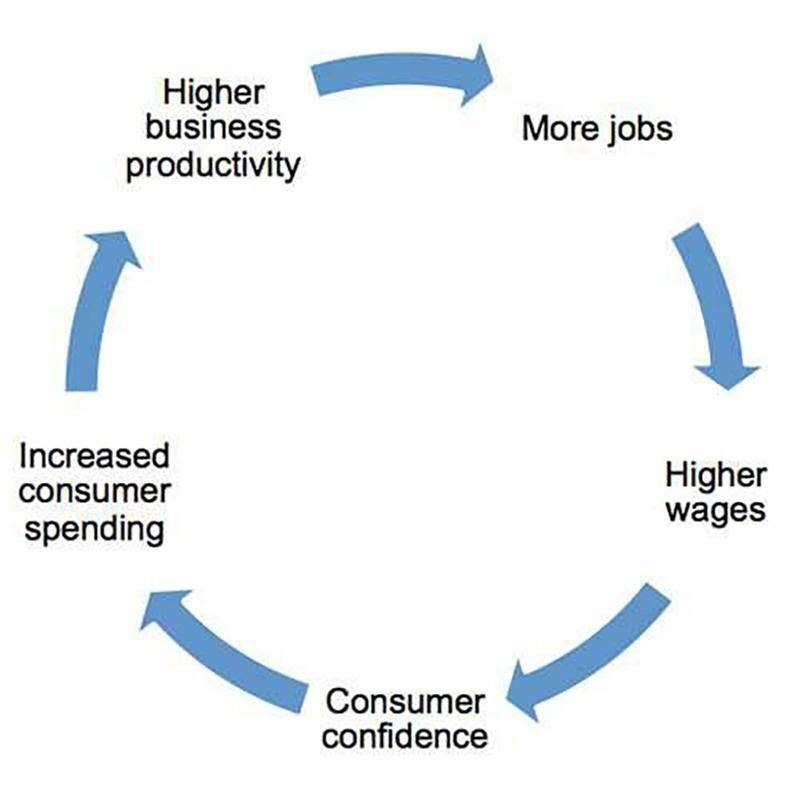 Business spending increases, hiring speeds up, production increases, sales increase, wages increase, consumer spending increases, and thus the cycle spins. Since the recession in 2009, the U.S. economy has been in a boom. Usually an asset bubble causes a recession. Asset bubbles develop when the economy is heading toward a boom and investors in an asset (stocks, bonds, real estate etc.) buy up the asset with high confidence that they can sell for an even higher price, until the market for that asset realizes there's less underlying growth in that asset than previously thought. Then, those asset prices tumble, and if that market is large enough, it will drain a significant portion of value that people across the economy had held. That could kickstart a recession. The housing bubble of 2008 developed when people thought housing prices would just continue to rise indefinitely. The Federal Reserve Bank had left interest rates too low for too long, causing home buyers to flood into the housing market, as their cost of borrowing remained low. High demand for houses pushed prices higher and higher. Then, house prices crashed when too many unqualified homeowners defaulted on their credit, causing mass home foreclosures. People lost their homes, lost their creditworthiness, and banks and investors exposed to defaulting credit crumbled. There were actually two asset bubbles at this time: housing and the mortgage loans supporting the home buying. Needless to say, this caused a recession. The U.S.' fourth-quarter 2008 saw GDP growth of -0.83%. The first-quarter of 2009 saw GDP of -1.75%. There were two consecutive quarters of negative growth, and the economy was officially in recession. The economic contraction hit a low of -3.06%in the second-quarter of 2009. Positive growth started again at the end of 2009. What Does the Federal Reserve Do During a Recession? The Federal Reserve Bank exists to cool the economy when it's in danger of overheating, and stimulate the economy when it's suffering. If inflation gets too high, the Fed must cool the economy. Wage inflation, or the increase in workers pay, usually indicates that there will soon be inflation, as people have more money to spend, causing demand for goods and services to rise. If there's not enough inflation, the Fed must stimulate the economy. In order to accomplish these objectives, the Fed either lowers or increases interest rates. Lower rates are a stimulant, as the cost of borrowing for both consumers and businesses decreases, freeing up cash to be spent. Consumers have less credit card debt and less bank debt, and are therefore more free to spend on a day-to-day basis, and sometimes spend more on large personal expenditures like houses or cars. Businesses can more easily borrow against capital expenditures. With lowered interest expense on their debts, they can spend a bit more on their operations. The opposite happens to both consumers and businesses when rates increase. The Federal Reserve does this by changing the rate the member banks (those that borrow from the Fed in order to lend out even more money) borrow at. If the Fed wants to raise rates, it raises the interest it lends at. The member banks lend at slightly higher rates than they borrow at in order to profit, so when the Fed hikes rates, the member banks are forced to lend at higher rates. Other banks must follow suit. If they didn't, their loans would be worth less in the bond market, as investors could just buy the higher interest ones. Of course, when the Fed lowers rates, member banks can do the same, as they'll still lend out at higher rates than they borrow at from the Fed. They want to compete with each other for borrowers - both people and businesses. The best economists, strategists, asset managers and analysts on Wall Street are currently trying to figure out whether the U.S. economy is currently at the peak of the economic cycle. The consensus of late has been that the U.S economy is either at a peak, or close to it. If we are at the peak, that means we're about to see economic growth slow down. As discussed above, business growth will slow down. Growth in corporate earnings will also slow and stocks won't perform well. We could be headed into a 'bear market,' or a market of falling asset prices, leading to losses to the stock portfolios of investors. If an investor shorts the market, he or she would profit in a bear market. Shorting is when an investor bets against a stock, so if the stock price falls, the investors profits. But the risk in shorting a stock is that we may actually still be in the midst of an economic boom, in which case corporate earnings will continue upwards at a fast rate. Those who claim to know the answer to the million-dollar question of 'where are we in the economic cycle?' with 100% unwavering certainty are either geniuses or idiots. If the economy were easy to predict, we wouldn't have to ask the question. Ironically, if everyone knew the answer, no investor could really make much money because all investors would be trying to do the same thing with their assets. John Traynor, chief investment officer of People's United Wealth Management, wrote in a note to clients "Our belief is that we are more likely looking at a slowing in economic growth in 2019 and 2020, rather than witnessing the beginning of a virtuous cycle." He added, "We believe business' capital spending will pick up from the low levels of the last several years." Economists at Morgan Stanley ( MS - Get Report) have a more pessimistic view. They see a 15% chance of recession in 2019 and 30% chance in 2020. We did see a slowing of employment growth in November. The U.S. added 155,000 jobs, less than economists' expectations of 190,000, and less than September and October's average of 170,000. While People's United Wealth Management has concluded, through extensive research, that we are at the peak, the analysts and strategists there don't think there will soon be a recession. Experts always assign probabilities, so People's United doesn't know that it will be 100% correct, but it believes it will come fairly close. The firm therefore does think there's some juice left in the stock market for the foreseeable future. "We are maintaining an overweight to equities based on our conviction that the economy will continue to expand." 'Overweight' means that they'll put their client's cash into stocks, or equities, more so than the benchmark investment portfolio. They're most optimistic on stocks than most market participants are. If they were 'underweight,' that would mean they'd be more pessimistic on stocks than the average participant in the current market. Chief Investment Strategist for LPL Financial, John Lynch, wrote in a note "We remain optimistic on the U.S. economy, and we believe that continued solid growth would likely support corporate profits and asset prices." He cited that the U.S.' recent solid GDP growth rate of 3.5% for the third-quarter won't taper off soon. He added, "The strong undercurrent of consumer demand continues to drive the economy, aided by accelerating incomes and fiscal stimulus." Fiscal stimulus just means President Trump lowered corporate and individual taxes. Corporations have more money to spend on big projects, and people have more money to spend on goods and services sold by corporations. The two feed off of each other, creating solid wage growth of 3.1% in the latest wage inflation reading. A few key factors will yield economic results over the next one to two years. The Fed could be raising rates too quickly, although it has indicated it may slow the pace of rate hikes in 2019. Tariffs, which are taxes on imported goods, are raising prices, and hurting demand (and tariffs on materials companies use to build their goods are raising production costs, causing companies to raise prices on goods, again hurting demand). Usually, bonds offer a safe haven from the risky stock market. But right now, bonds may not be the best option because of what's called interest rate risk. With the Federal Reserve raising rates once more in 2018, and possibly several more times in 2019, the bonds previously issued at a certain percent of interest are now worth less than the newly issued bonds, which carry higher interest than the previous ones. Many of the previously issued lower interest bonds have already been sold for lower prices than their face value, or the amount paid for the bond at issuance. Investors can by these bonds with less risk, but they still might have marginal interest-rate risk. It all depends on how aggressively the Fed raises rates in 2019. Watch our video with Chief Market Strategist of TD Ameritrade, JJ Kinahan, who explains how investors behaved during October's rough month in stocks, and how he expected them to behave to close out the year, which he has been right about so far.